Our associate editor Anupama Pilbrow asks Stellar contributor Ellen Cregan about her poem, Generations. Your poem Generations explores a museum exhibit of women’s fashion over the years. Were you motivated to write Generations after viewing an actual museum display? The idea for Generations didn’t come from an actual exhibit. I wrote it after visiting a market stall full of vintage sewing patterns grouped together by their respective eras. This planted an idea in my head of a museum full of historical fashion and the seamstresses who created it. Generations seems quite observational—it trades in very small details. The ‘thread gathers, slips under,’ this is quite a measured image. In your writing, does your inspiration come from observations, images, moments that you witness? What is your writing practice like? Most of my writing begins with an image. Sometimes this image is real, but more often that not it is imagined. My writing practice generally revolves around small details. I tend to be quite a perfectionist in may aspects of my life, and focussing on the tiny details when I write plays into this tendency quite well. I like things to be perfectly quiet when I write, which helps me get into the right headspace to zoom in on the little details of the image or moment I’m trying to convey. You say that you are a ‘craft-lovin’ writer. Is there any particular craft you love most? And, does your love of craft influence your writing? My favourite craft of all would absolutely have to be sewing. I sew all of my own clothes, which I find to be incredibly therapeutic. I’ve also recently started knitting and would love to learn embroidery—if I’m not constantly doing something with my hands, I feel like I’m being lazy! My love of craft has been a major influence on my writing over the past year or so. I feel like crafting and writing have a great deal in common. They both require quiet, focus, and attention to detail. Craft is a huge source of inspiration for me, and is something I really love to explore in my writing. 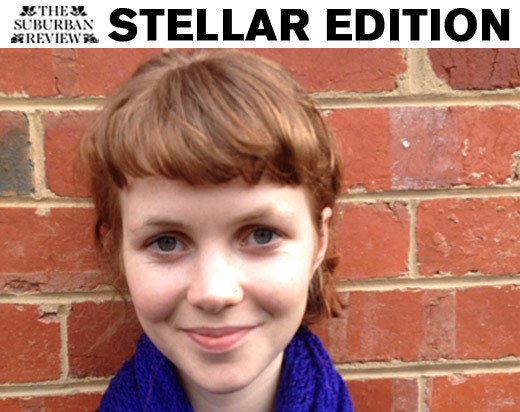 You can pick up a copy of the Stellar Edition here. The Suburban Review is a quarterly digital journal of short fiction, creative non-fiction, poetry and art. We’re interested in publishing the work of writers from all over Australia and the world. © The Suburban Review, all rights reserved.